Fried rice is classic Asian comfort food, with as many variations out there as there are cooks. Anything goes! Use chopped up leftover vegetables or meat, or make this easy version with edamame and shiitake mushrooms. The trick is to start with chilled, day-old rice. It results in a crispy texture, instead of soggy grains. Dried shiitake mushrooms have a far more concentrated flavor than the fresh ones. Be sure to get dried shiitakes for this recipe; otherwise you’ll miss their fragrant perfume. 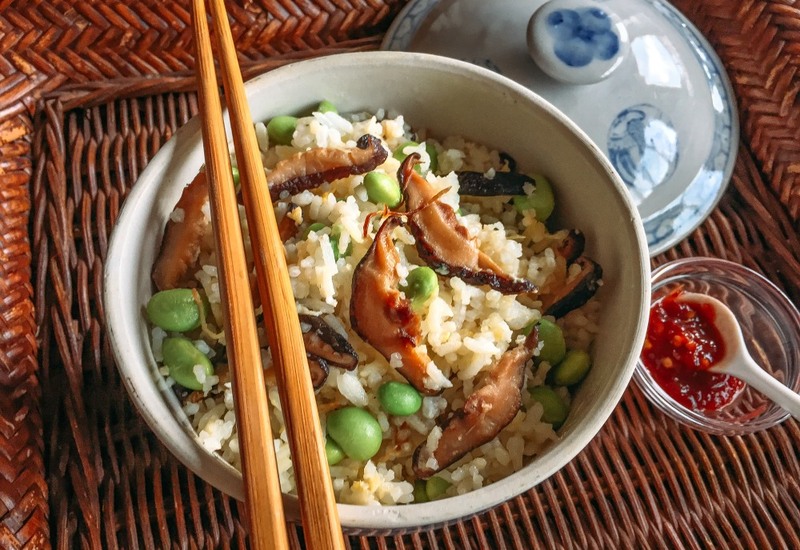 If you want to double up on the umami mushrooms flavor, add 8 ounces of sliced fresh shiitake mushrooms when you add the rice. Chilled day-old rice is essential to making successful fried rice. Traditional Chinese fried rice is delicate and light, and yellow in color from the egg added during cooking—not the heavy, dark soy sauce-brown familiar from many Chinese take-outs. Per Serving: 349 calories; 11g fat; 52.6g carbohydrates; 11g protein; 47mg cholesterol; 168mg sodium. This vegetarian fried rice was really simple and delicious. I love the mushroom and edamame take. I used crispy, oven roasted edamame that I have left over and it added a nice crunch to the dish. Also, the added ginger was the perfect addition for a kick of flavor. From now on I'll always use day old rice, it was the perfect texture. Just like my Great, Great Grandma used to make! I thought this was a good recipe, but I wish that it would have included soy sauce or some other ingredients to add more flavor. Using day old rice was perfect and it was easy to make. I did add soy sauce and it garlic, so that helped. I used brown rice this fried rice. It's super filling and perfect for a weekday lunch. I also added shredded carrots because I had a bag in my fridge I wanted to get rid of. So used to the heavy, dark fried rice so this lighter version was a pleasant surprise. I used brown rice that was made in a pressure cooker. Quick, simple, really good.